Included with the D610 body is the Nikon AF-S NIKKOR 24-85mm f/3.5-4.5G ED VR lens; a versatile wide-angle to portrait-length zoom lens. This lens features VR (Vibration Reduction) to minimize the appearance of camera shake and also integrates one extra-low dispersion element and three aspherical elements to minimize chromatic aberrations throughout the zoom range and enhance the overall clarity and contrast. Box Dimensions (LxWxH) 14.3 x 8.5 x 6.8"
D610 DSLR Camera with 24-85mm Lens is rated 4.7 out of 5 by 41. Rated 1 out of 5 by Martin B from Beware of the return of the spots issue I've have owned a Nikon D610 for exactly one year. This D610 was a replacement for the D600 which had an issue with oil spots getting on the sensor resulting in getting grey spots on every photo on the upper left corner. The D610 is a great camera and combined with a really great lens, it's an awesome camera but while editing a small batch of photos, I noticed the spots. How can this be? This cthe D610 camera was basically released for the D600 users as a settlement and it has issues. I've called Nikon about the issue and I have sent the camera in for an evaluation (at my expense) I hope they can solve this issue because a professional photographer, I need my camera almost each and every day. Rated 5 out of 5 by Phanntom from My First and Last Full-Frame Camera I've had my D610 now for 6 months. I've been shooting with my D80 since they came on the market and while the camera still works well, I needed the Live-View to assist my old eyes with focusing. I was stunned with how much different the shots taken with the D610 were over my old D80. The clarity, and color are fantastic, showing detail, even in low light one wouldn't expect to see. 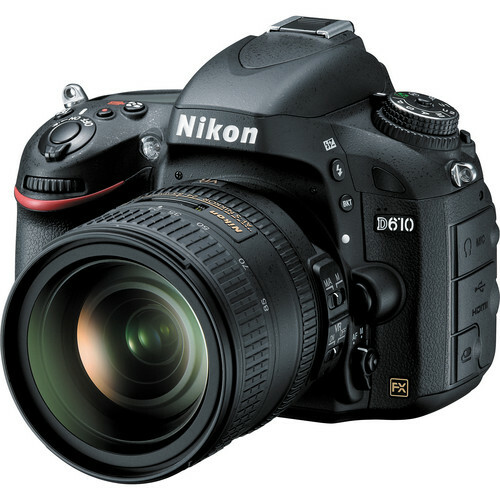 The menus are easy to use if you're already familiar with the Nikon digital cameras. The kit 24-85 lens does a fantastic job and will be fine for most peoples work. The battery life is excellent, just as it was on my D80. Based on my 6-months with it, I can't imagine ever having to upgrade again....this camera does it all. Rated 5 out of 5 by Anonymous from Fantastic Camera, Awesome in Low Light Purchased this camera two weeks ago, and already I have been able to get absolutely fantastic pictures of the night sky and milky way. The camera handles well, and the autofocus and metering have operated as I have expected. Controls are well laid out, except for an awkward reach on the front function buttons. Rated 4 out of 5 by Mel from Good enough I bought this camera as oppose to the Canon 5D II. I decided on this because it is more reasonably priced than the Canon. So far it has been a delight to use. The only issue I have with this camera is when shooting fast/burst it's lagging behind because of buffering to the point of not firing anymore. Just make sure you use a fast SD card especially if you shoot both jpeg and raw. Rated 5 out of 5 by EKM from Great camera! I use the D610 in my aerial photography business as well for personal use. I have owned several Nikon cameras over the past 15 years, and have always been impressed with their quality - the D610 does not disappoint! This camera produces exceptionally high quality photos and offers all the flexibility I need. It is also the smallest of the full-frame Nikon models which is important to me in the tight confines of an airplane's cockpit.